De Wolfberg’s terrace in Groesbeek is unique. Situated at the edge of the woods, it offers you an enchanting view of the green hillside pastures, sloping downwards to the valley. The idyllic and picturesque village lying down in the valley will definitely capture your attention. If you like to have lunch, order a high tea, enjoy a tasteful glass of wine or dine with friends and family, our terrace would be the lovely place to be. The terrace is also well-suited for a business lunch, when a bit of privacy would not come amiss. The tranquillity and beautiful view make the terrace a pleasant place to have a business meeting at. The spaciousness and peacefulness of the area send a silent invitation to linger leisurely. 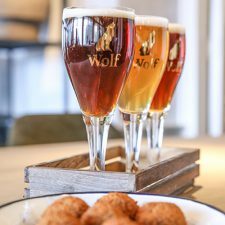 De Wolfsburg has an extensive menu with excellent wines and tasteful bites. 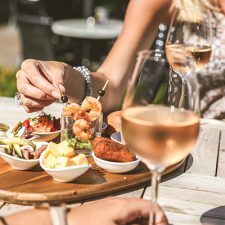 You could also try a High Wine; it consists of a bottle of wine to your choosing from the menu, a pitcher of water and a wooden board filled with delicious warm and cold bites. The added deck with heated terrace makes the terrace a pleasant place to be, even in early spring or late autumn. The terrace is opened daily from 10.00 a.m. until the moment the bar closes. Wolf 7 Blond, Wolf 8 Dark, Wolf 9 Amber. And some bitterballen from Kroketterij De Bourgondiër to share. A wooden board with a selection of warm and cold bites; scampi, olives, cold cuts, cheese and bitterballen.